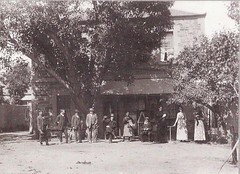 Dora (Dorothy Ann) and James William Quinn were licensees of the Willunga Hotel from 1897. Tragedy struck the family when their six month old daughter, Dorothy Ann, died in 1903, followed by James in 1904. Dora continued as licensee of the hotel with their two remaining children, Molly (Mary Bridget) and 5 year old Andrew (James Andrew). During the First World War, Dora, was a loyal contributor to Cheer Up Society events. In 1916, she was one of the members who, since the formation of the Cheer-up branch...have worked energetically, forwarding hampers and cases of fruit weeklv, also parcels of woollen goods and kitbags, to the Cheer-up Hut. In 1919, Dora hosted some of the soldiers who attended a demonstration in aid of the Returned Soldiers’ and Sailors' Building Fund on the recreation ground. The activities included horse races, sports, fancy dress, afternoon tea, the McLaren Vale Brass Band and, in the evening, the Returned Soldiers' Orchestra concert. The soldiers were entertained for the week-end by, among others, Mrs Quinn, with an outing to Port Willunga. Dora Quinn also hosted members of the orchestra from North Adelaide Blind Institution for a week-end in 1919 when they gave a grand concert in the Agricultural Hall, in aid of the local Cheer-up Society funds. Although her daughter, Molly, is not mentioned by name in newspaper accounts of Cheer Up Society events, it is probable that she was a ‘Cheer Up Girl’ who joined in with her mother, making hampers and parcels and helping with organisation, the provision of food and entertainment. After the war, Dora continued to run the hotel with the help of Molly and Andrew. Andrew was a keen lawn bowler and Molly enjoyed playing croquet at the Willunga club. Andrew died in November 1940 at 40 years of age and, after Dorothy’s death in March 1941, Molly took over the hotel. Molly remained at the hotel until she sold the lease in January 1949 and moved to Adelaide. The Willunga Hotel had been in the family for 52 years. The Quinn family were active members of St Joseph’s Catholic Church and are all buried in its cemetery, with a memorial window and Baptismal Font in the Church. Molly featured in social and fund raising events at the church and continued her support of charities until her death in 1995 at the age of 94. At the back of Quinn's Willunga Hotel, under the Moreton Bay fig tree. Do you remember Quinn family ? Then Join up and add your memory here.